Fuelled by the summer's successful community park projects the Molson Canadian Red Leaf Project switches gears starting this weekend to support the Great Canadian Shoreline Cleanup, a program that's removed almost 1 million kilograms of waste from Canadian shorelines over the past eighteen years. 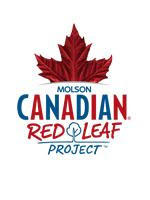 As part of Molson Canadian's ongoing commitment to give back to the land, the Molson Canadian Red Leaf Project hosted 20 events across the country this past summer, inspiring Canadians to volunteer to improve their local parks as well as planting 100,000 trees from coast to coast. "The enthusiasm Canadian's had for this summer's park projects and their support for our tree planting initiative exceeded our expectations; this project has been a great vehicle to channel Canadian's passion for the outdoors into action," says Jamie Sprules, Senior Brand Manager, Molson Canadian. "This fall, we are excited to partner with the Great Canadian Shoreline Cleanup again and encourage Canadians to get involved by participating in a local cleanup." People across the country can participate in the Great Canadian Shoreline Cleanup from September 17 to 25 by registering to volunteer as part of a team, or captain a local project. This nationwide event saw 47,000 people participate in 2010 to clean the shores of lakes, rivers and oceans in their communities.